Visiting Loreto Aprutino’s Festa di San Zopito got me more interested in the stories behind the monumental, 13-tonne white ox with his carefully trimmed and polished hooves, multi-coloured ribbons and bells looped high over its head as it was led round the streets by an Abruzzese bagpiper, a Zampognari, whose job was traditionally a shepherd. For those not up-to-date with the Christian calendar (like me! ), Pentecost was taken from the Jewish harvest festival celebration, Shavout, when 50 days after Passover the law was received on Mount Sinai, a week of refrain and a day of non work. The Romans fashioned this into the Church’s birthday, Pentecost; instead of law, a time when the Holy Spirit descended and entered into the apostles on Whitsun or in Italian Pasqua rosatum, named after the priest’s red vestments, a colour symbolic of the Holy Spirit, those who receive their first Holy Communion on this favourable day wearing white. After reading Noel’s post about the event, there was a v short Comment referring to the Romans. It seems they loosely wrapped up two of their April festivals into this new feria (non work day), the celebration of Ceres, Cerealiais’ who was, Jupiter’s wife, and goddess of fertility and whose followers wore white. The Romans believed that it was Ceres who taught man to plough and sow, unusual because it was juxtaposed with the people’s favoured offering, the white ox, to her husband, Jupiter. Floralia was the 6-day lascivious celebration, part of which became May Day, banned by the Pilgrim Fathers, and celebrating Spring’s baroque blossoms, it was a time to wear nothing(!) or highly colourful clothes red, green, yellow and floral wreaths. A descendent of the flower offering remains in the traditional red flowers left at Church on Pentecost to signify the renewal of life, remembering family and friends no longer here and of course the warmth of the summer and blessed crops. Relics were brought in ornate box to Loreto in 1711, an arm and the skull donated by Pope Clement XI. They passed a farmer, Carlo Parlione who complained that he had to toil granite fields on Pentecost, asking where the damn justice was in that. Apparently the convoy shrunk back from such double blasphemy, but at that very moment, the farmer’s oxen walked toward the entourage ignoring the farmer‘s calls and knelt as if he wanted to pray. “A miracle”, they joyously proclaimed and the farmer repented, returning home to observe the Pentecost. 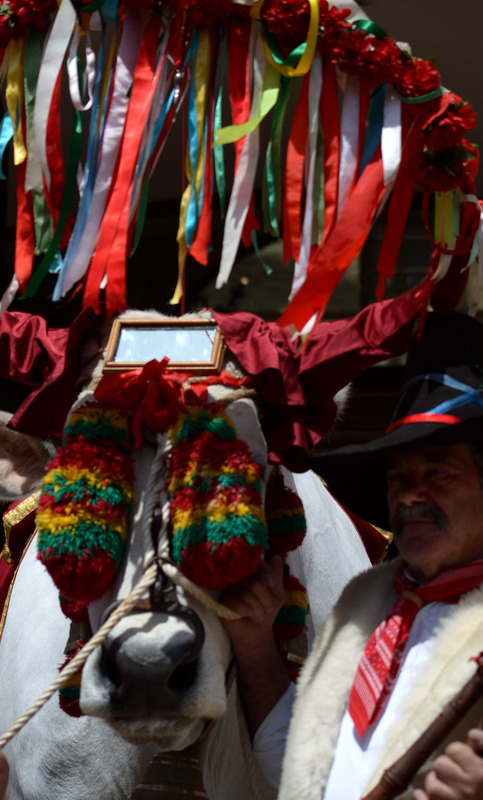 The Festa di San Zopito is now a colourful 2-day festival celebrating this oxen moment. The trained ox, nicknamed the ‘White Knight’ wearing a scarlet cloak with images of the Saints, carrying those same relics, kneels and gives praise in specific areas of the town as he is a tramite (vehicle of the divine). A local primary schoolgirl stands on its back representing San Zopito, with floral wreath, silver wings, a red carnation (representing the Holy Spirit and harvest) in her mouth and carrying an umbrella to protect from evil & disgrace. They are accompanied by a Processione dei Cavalli, with riders dressed in traditional costume and horses in a stunning rustic dressage, bedecked with garlands, bows and pom-poms. They traditionally received a blessing to counter bandits and such like as they delivered the area’s precious golden triangle’s olive oil and wines. 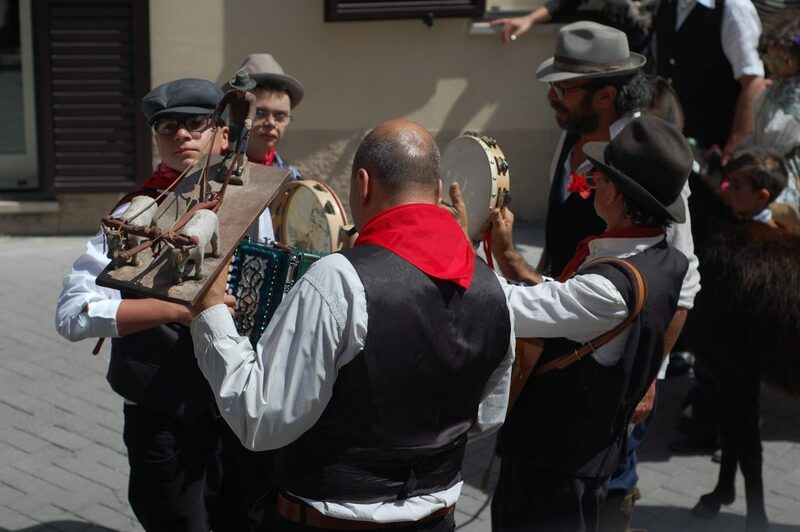 The ox is taken to 2 churches and onto Palazzo Valentini, a famous local winery who offer wines and taralluci biscuits to those that follow the procession. On Monday the bue (ox) makes another procession, this time to meet the silver statue of the Saint. It’s really worth a visit, particularly if you have children as the combined colour, music and of course animals are a dream morning out for the under 10s, it’s not bad either for adults especially if you’re a photographer. Thanks to AboutAbruzzo for the tip of arriving early; it is like Abruzzo’s snake festival Cocullo, extremely popular, so best get there for 10 and then have a leisurely patisserie-led brunch in one of the many cafes on Loreto Aprutino‘s main drag, before you walk up to the historic centre and procession. If you fancy a Pentecostal picnic there are plenty of porchetta vans ready to oblige for your lunch!